I’ve always taken for granted that everyone celebrates New Year’s. Of course some cultures have their own calendars and New Year’s Day may be different. Over the past few months, I’ve noticed so many similarities between Canada and Scotland, and though I love my home and native land, the Scots do New Year’s way better. Hogmanay is a four day festival, venues sprung up all along Princes Street, the gardens below and even to the Royal Mile – the biggest crowds came out on December 31, but Princes Street was busy each of the four days. On December 30, a torch procession from the Royal Mile to Calton Hill got things started. Once the flame arrived on Calton Hill, a big cauldron was lit (just like the Olympics) and music and fireworks could be heard from miles away. This whole bit was a total surprise to me – I watched the fireworks from the window. Amusement Park rides have been set up around Princes Street – they’ve been there since November but were taken down a week ago. I always thought the PNE rides were too expensive, but the ones on Princes Street are worse and cost more. 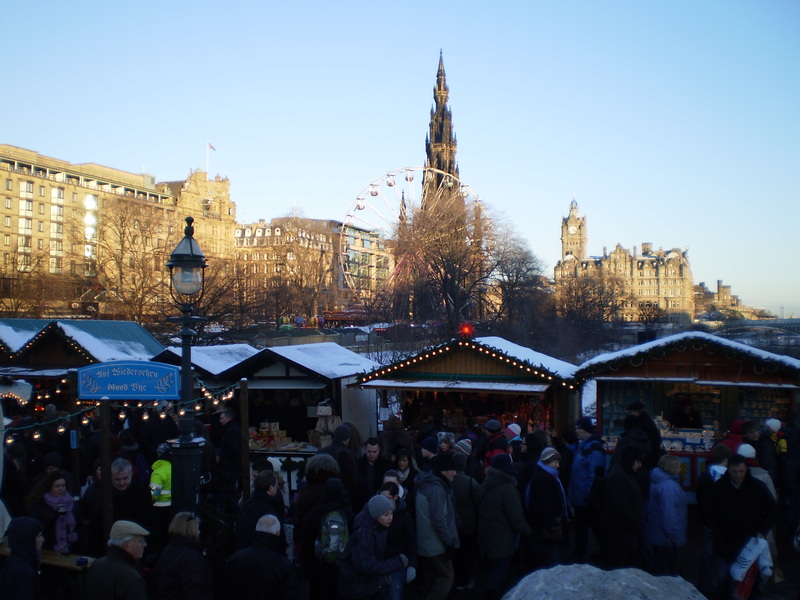 The German Market was taken down just after Christmas to make way for a Hogmanay stage. This is where Aarti and I went for the ceilidh. If you look closely, you can see the old ferris wheel in the background. We slipped the willow and did a few other dances, but the crowds were pretty intense. It was hard for me to deal with all of the crowds. Getting through the entrance was challenging enough. They wouldn’t let us go in and out either. This combined with the crowds kept the exploring down to a minimum. An unfortunate side effect of big events is they tend to be over organized (to prevent the worst case scenarios) or badly organized. This had a bit of both. This was not the case when it came time to blow stuff up – the fireworks over the castle were remarkable. Afterwards, a big screen over the national gallery helped us with the words to Auld Lang Syne. It started clearing out after that. Most of the bars were already filled up so we went home fairly early. The long lines for booze kept us fairly dry, but other people brought some in (plastic bottles were the only ones allowed) so the people watching on that walk back was exceptional – we saw the barely awake, we saw a couple of fights, we heard some completely unintelligible conversations, and there is almost nothing better than watching a skinny drunk girl in a fancy party dress trying to stay up on her high, high heels. KT Tunstall, perhaps Scotland’s most exported singer, played a big show on January 1. She made it big with that song Black Horse and a Cherry Tree. I didn’t go but I’ve heard some of her other songs too and bet it was a good show. I heard the closing event was a rugby match between Glasgow and Edinburgh on January 2nd. The final tally for December 31 was apparently 80,000 people. Many of them from outside Edinburgh. You ever hear a song that is instantly familiar. I know I’ve heard it before but couldn’t say when. Its hard not to get a little choked up listening to this. Here are the lyrics.